Our economy has a trade problem. Our trade deficit measures the extent of the problem. Our trade deficit continues to be enormous and humongous. The Census Bureau reports the February U.S. deficit on trade with other countries fell to $43.6 billion, down $4.6 billion from a revised $48.2 billion. This follows January’s big increase. Our exports were up $0.4 billion from January, to $192.9 billion. Imports were down $4.3 billion to $236.4. The United States’ enormous, humongous trade deficit with China increased $1.6 billion to $31.7 billion. Any way you look at it, our economy bought $43.6 billion more in goods and services in February than it sold. $43.6 billion of our economy’s “demand” is translating into jobs, wages, and production elsewhere in the world. It has done this month after month since the late 1970s and shows no sign of balancing. 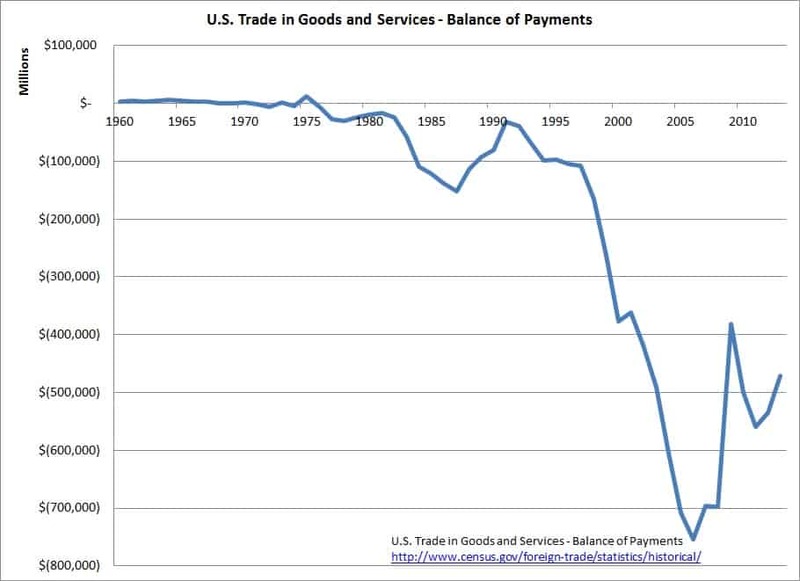 So … the late 1970s saw the beginnings of our trade deficits, which grew and grew. 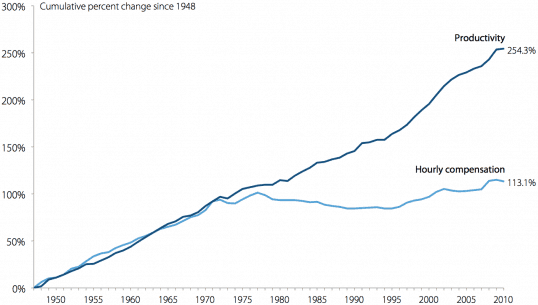 And the 1970s also saw the “decoupling” of wages from productivity growth. Put another way, until the late 1970s, if companies in the United States were getting orders, they had to hire people here to work for them to fill those orders. So they had to pay what the “market” for workers was demanding. And this kept wages rising. At the same time, people in this country were demanding that our environment be cleaned up, and that companies pay for their own mess. But then as”free trade” ideology and policies took hold, companies were able to find cheaper labor in countries where there were few environmental protection costs. So companies were able to tell American workers with their demands to get paid a reasonable amount to f*** off. Because of “free trade,” labor’s power went away and American wages have stagnated ever since. While we’re at it, one more thing the late 1970s brought was the big fight against inflation, which over time eats up the value of the cash holdings of lenders, while reducing the obligations of borrowers. Thanks to the fight against inflation, every time the economy picked up enough that companies might have to start paying more to hire enough people here to meet demand here, interest rates would be increased, slowing the economy just enough to keep unemployment high enough to keep “wage pressures” down. The war on inflation is another way that labor’s power to demand reasonable wages was crushed and that American wages have stagnated since. For many, the North American Free Trade Agreement (NAFTA) has become the symbol for the loss of American jobs. The pact opened up low-wage Mexico for American manufacturers, and was fiercely debated before it took effect in 1994. As a presidential candidate in 1992, Ross Perot warned about the “giant sucking sound” of jobs going south. Across the country people heard him say this, and then they saw it happen. People saw how NAFTA and the loss of jobs to other countries beyond Mexico and Canada took manufacturing jobs that people and communities depended on. So NAFTA became the one-word symbol for all of the trade problems that the trade deficit represented, especially in areas where auto and auto-parts manufacturing jobs moved to Mexico, like Flint, Michigan. Then, in the 2000s companies took job flight to the nth degree, moving production to China as fast as they could, to escape American democracy’s wages and protections, with executives and investors pocketing the difference instead of reinvesting it in our economy. China’s entry into the WTO accelerated the problem, but for many “NAFTA” remained the one-word, shorthand description. The extraordinary plunge in manufacturing jobs in the years 2000 to 2007 was due to the explosion of the trade deficit, which peaked at just under 6 percent of GDP ($1.2 trillion in today’s economy) in 2005 and 2006. This was first and foremost due to the growth of imports from China during these years, although we ran large trade deficits with other countries as well. There really is very little ambiguity in this story. Does anyone believe that if we had balanced trade it wouldn’t mean more manufacturing jobs? Do they think we could produce another $1.2 trillion in manufacturing output without employing any workers? The 2000s saw a massive plunge in manufacturing jobs, which also devastated jobs supporting manufacturing along with entire supply chains, communities and regions of our country. There was no response from our from the Wall Street-captured political system, except for lectures about “lower prices” from imports, and places like Detroit, parts of Pennsylvania and Ohio and upstate New York were left in desperate straits. Opioid addiction and other social problems multiplied. Then, as we all know, the conditions and all the trade problems that the word “NAFTA” represents to people in these regions were exploited by candidate Donald Trump for votes. Trump promised to do something about this trade problem. Enough working-class Democrats swung Republican to put him in office. Massive voter suppression, Russian interference, and the lack of a Democratic economic message didn’t help, either. Trump said what he needed to say to get votes and got enough of them. Once in office, of course, con-man Trump is reversing himself. He has offered “studies” of the problem, while drafting a notification to Congress that he intends to make only small changes to NAFTA, renegotiating it along the model of the Trans-Pacific Partnership (TPP), which he opposed during the campaign. How Do We Fix Trade? Trade and “trade agreements” are not automatically bad. No one opposes trade. But our popular understanding of what they are is mistaken. American companies already trade with other countries and don’t need trade agreements to do it. If a democracy has a tariff or trade barrier in place perhaps it is there because the people of the country have a good reason they want it there. Wall Street’s propagandists declare that our government must be blocked from legislating “protectionism,” in order to “expand trade.” They say that tariffs and barriers are necessarily bad and “agreements” that block countries from imposing them are needed. Many of us have unconsciously absorbed many of Wall Street’s rarely-countered arguments that are used to sell the country on pro-investor, anti-labor policies. But current “trade” policy is really just about making agreements that do little more than keep governments from being able to legislate to protect their public’s interests from those of giant corporations. Trade agreements bypass a country’s protections, opening their markets in ways that make it easier for larger companies to move production in search of cheap labor and low environmental-protection costs, or to dominate markets across borders by using economies of scale to wipe out local competition. A typical trade “agreement” today is a corporate-negotiated agreement saying that our democratic government will be prevented in the future from applying a tariff or barrier to entry or other protections to goods or services being brought into the country, in order that businesses can make more profits. Yes, in the past giant, monopolistic “buggy whip” industries could corruptly purchase protections and subsidies and trade barriers, causing competition and innovative industries to be held back. So “trade agreements” preventing legislation to protect national interests were sold as the solution to this corruption of democracy. But in a functioning democracy, if We the People decide we want to “protect” wages or industries for whatever reason, that should be our decision. We should not have “agreements” that prevent us from doing so, in order for a particular business to benefit. We need go into “trade deals” with eyes wide open and not just to “lower tariffs” and fight “protectionism.” We cannot just let corporate interests negotiate agreements. We can’t keep coming up with agreements that restrict our democratic sovereignty, just to benefit businesses. “Stakeholders” like labor, environmental groups, consumer groups and representatives of all the groups and interests of our society might be involved. Currently “trade” agreements are used to undercut American wages and worker and environmental protections. But trade and our entire economy would be very different if our country had full-employment policies leading to every American being able to find a job of their choosing. With policies to support full employment, employers lose money and opportunity because they can’t find enough employees, so the economy is hampered from achieving its full potential. With full employment, labor has the bargaining power to keep trade and immigration from forcing wages down. If done with the interests of working people here and in trading partner countries in mind, policies to promote full employment at home would create a rising standard of living worldwide.